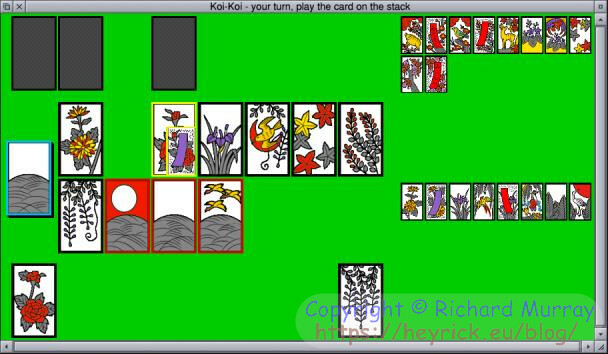 In 2011, I got myself a deck of Hanafuda cards and taught myself Koi-Koi. 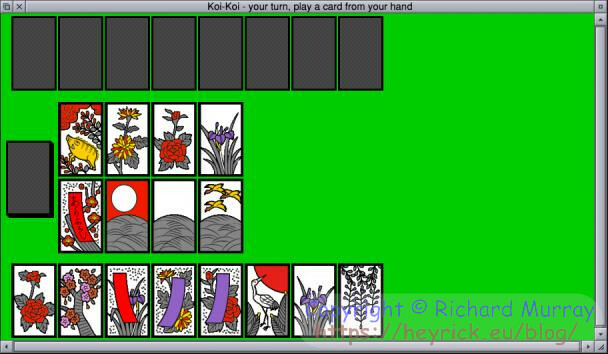 In 2012, I started to write a Koi-Koi game for RISC OS. Because I was working nights (and consequently remember very little of that time), I pretty much forgot about the game. I recently rediscovered the source code and decided, in honour of RISC OS becoming "open source" (!) decided that I would make a choice. 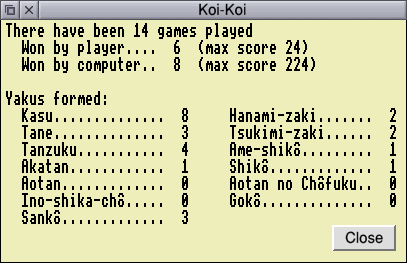 Koi-Koi will work (enough to play a game) by November, or I'll delete the entire project. The first playable version was ready at 11pm on Halloween night, but I wanted to wait for an official namespace allocation before releasing it. That done, and some extra features added, I released the first version to the RISC OS community on November 3rd. Followed by an updated version today in which cards are arranged in the capture area, and there is logic for who plays first. I won't explain what this is about, the game instructions describe everything in detail. It is worth noting some of the cards have coloured borders. Yellow means a 'captured' card (with the one that captured it superimposed in small), cyan means the current card being played, and red indicates cards that match the card being played. It's still "alpha" quality, and has a way to go to be feature complete, but it's quite playable and even the braindead computer player is capable of playing a good game - as you can see from the stats above! This software is for RISC OS!